A facility that compounds sterile drugs may elect to register with FDA as an outsourcing facility. Each facility at a separate geographic location or address must hold a distinct registration. Outsourcing facilities are subject to GMP requirements and can only compound with drug substances that are on a “clinical need” list established by the U.S. Food and Drug Administration (“FDA”). Outsourcing facilities can compound large quantities of products on FDA’s drug shortage list without prescription and is not required to be a licensed pharmacy. Under the Drug Quality and Security Act (DQSA), an outsourcing facility is not considered registered until all registration fees owed by the facility have been paid. Beginning in fiscal year (FY) 2015, outsourcing facilities that elect to register with FDA must pay an annual establishment fee. Each year, the registration period for outsourcing facilities begins on October 1st and ends on December 31st. The annual establishment fee is paid at the time of registration and is equal to the sum of $15,000, multiplied by the inflation adjustment factor plus the small business adjustment factor. The FDA will publish a notice in the Federal Register announcing the amount of the establishment fee to be collected in a given FY (based on the calculation set forth above) no later than 60 calendar days before the start of that FY. Beginning in FY 2015, an outsourcing facility will be assessed a reinspection fee each time it is subject to a reinspection. Reinspection is defined as: “one or more inspections conducted under section 704 subsequent to an inspection conducted under such provision which identified noncompliance materially related to an applicable requirement of this Act, specifically to determine whether compliance has been achieved to the Secretary’s satisfaction.” The reinspection fee is designed to reimburse FDA when it must visit a particular outsourcing facility more than once because of noncompliance identified during a previous inspection. The reinspection fee will be equal to $15,000 multiplied by the inflation adjustment factor. The inflation-adjusted reinspection fee for each FY will be published in the Federal Register not later than 60 calendar days before the start of each FY. Outsourcing facilities registered before October 1, 2014 do not have to pay a fee for FY 2014. To maintain their status as outsourcing facilities in FY 2015, however, those entities will have to register during the FY 2015 registration period (October 1 – December 31, 2014). Failure to pay the fee by December 31, 2014, will result in an entity losing its status as an outsourcing facility. 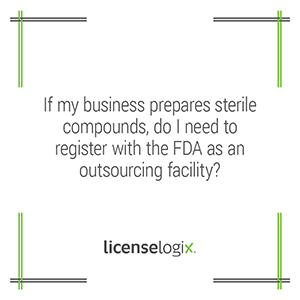 In addition to the FDA registration, many states are beginning to require licenses for outsourcing facilities. LicenseLogix tracks all licensing regulations in all states for outsourcing facilities. Let us help you determine which licenses your company needs, obtain all licenses, and manage ongoing license renewals. For additional help you can click here, or give us a call at (800) 292-0909.